HONG KONG—According to the Hong Kong-based Information Center for Human Rights and Democracy (ICHRD), Chinese authorities recently dispatched an additional 2000 armed officers into Ganzi Tibetan Autonomous Prefecture—a once important city in the bygone Tibetan Province of Kham, now located in China's Sichuan Province—to prevent future riots and demonstrations. The campaign aims to expose and criticize the influence of the Dalai Lama, as current clashes between police and Tibetans were sparked by one man who appealed to authorities to allow the Dalai Lama back into Tibet. According to the ICHRD, on August 25, the surge of special combat officers of the Sichuan Armed Police Contingent, joined the 38th Mobile Division of the Sichuan Armed Police and entered the Ganzi Prefecture, including the counties Litang, Kangding, Luding and Daocheng, in an effort to prevent further rioting. In addition, on August 30, Li Chongxi, a deputy secretary of the Sichuan Provincial Party Committee, and Zhang Zuoha, a vice governor of the Sichuan Province led a meeting of the prefectural government in Ganzi. In total, about 260 government and Party officials above county level attended, discussing the reasons behind and gravity of the recent incident in which Runggye Adak, a 53-year old Tibetan, requested that authorities allow the Dalai Lama back into Tibet at a gathering on August 1 marking Chinese Army Day. The incident occurred during the Ganzi's Chinese Army Day celebration on August 1 when Adak suddenly walked onto the platform and took the microphone to speak to the gathering. He told officials his idea of bringing the Dalai Lama back to Tibet. Adak was arrested on site. Soon afterwards the outburst prompted a sanguinary conflict between nearly 1000 Tibetans demanding his release and hundreds of security forces. 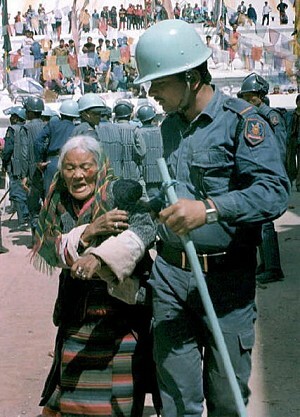 The riot badly injured at least two Tibetans, and 30 others were arrested. Coming just before China's important 17th National Congress, some say the goal of this high level meeting was simply to demonize the Dalai Lama and his supporters as political reactionaries, and religious hypocrites that aim to undo local political stability. The Ganzi Provincial People's Procuratorate sued Adak for “instigating the subversion of the state power” on August 27.